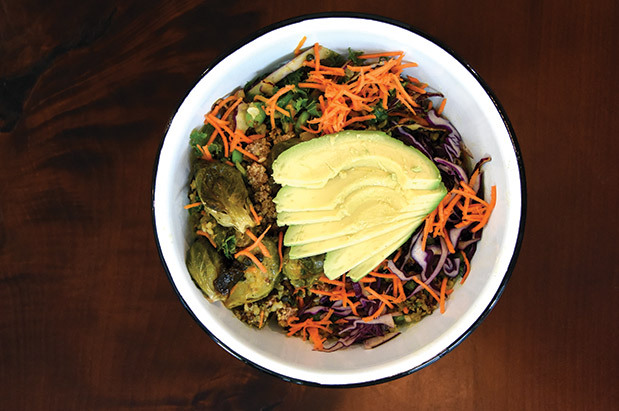 Food We Love: Buddha Bowl at Sweetgrass Food Co.
I’m a kitchen-sink salad eater. None of this simple romaine-and-tomato-only business for me. Instead, I crave a big bowl with bright, beautiful vegetables and bits of crunchy surprises, topped with a fork-licking-good dressing. I recently found just that when I tried the Buddha bowl ($9.50) at Sweetgrass Food Co., a cheery café in the Denny Triangle area. Rich coconut brown rice is a base for lentils, sprouted quinoa, slivers of kale, carrots, red cabbage, as well as edamame, roasted Brussels sprouts, avocado and crumbled mira bar—an in-house treat made with cashews, dates and figs.